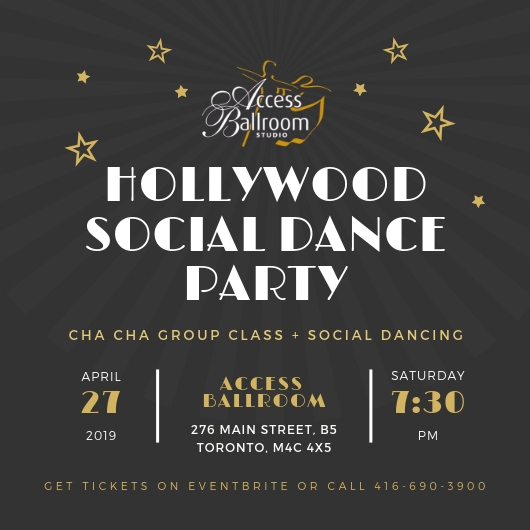 Put on your fancy attire and get ready to dance your shoes off at our upcoming Hollywood Social Dance Party and Open House on Saturday, April 27! Check out the photos from 2018 Hollywood Party on Facebook. Doors will be open at 7:30 pm. You are welcome to enjoy a FREE Cha Cha group class starting at 7:50 pm. Three group classes will be running at the same time. One will be for beginners, one for intermediate and one for advanced dancers. 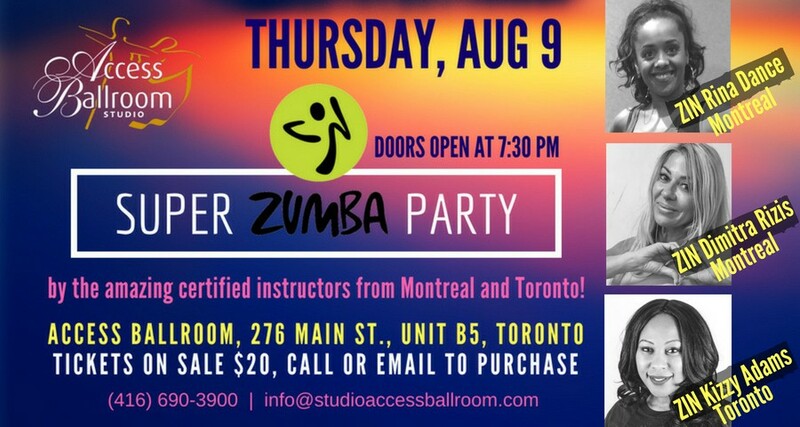 Then after the group classes, everyone is invited to participate in the social dance party from 8:40 pm to midnight! The party will feature students and teachers’ performances, interactive games, prizes and lots of dancing. Complimentary snacks and non-alcoholic beverages will also be provided. Dress up like a Hollywood star OR a movie character and make everyone guess who you are! Check out Pinterest for some costume ideas. Check out the best celebrities looks from the 2019 Oscar’s ceremony. The best-dressed will, of course, get a prize! So dress to impress! Question: I am a student at Access Ballroom. Can I bring friends and family to the Hollywood Social Dance Party and Open House? Answer: Yes, of course! 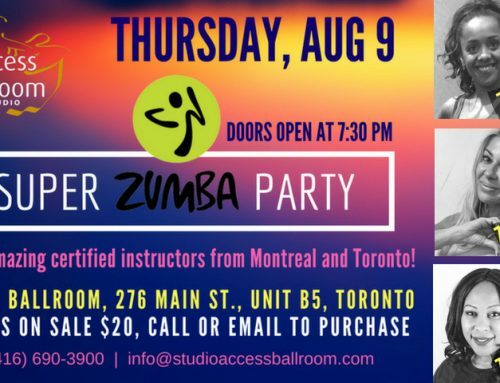 Your family and friends are more than welcome to join the party, participate in the FREE group class and enjoy the performances. If you are one of the students who will be performing, inviting your loved ones is a must! Question: I am new to Access Ballroom and would like to learn more about the dance school and what you offer. Is the Hollywood Social Dance Party and Open House for me? Answer: Absolutely. 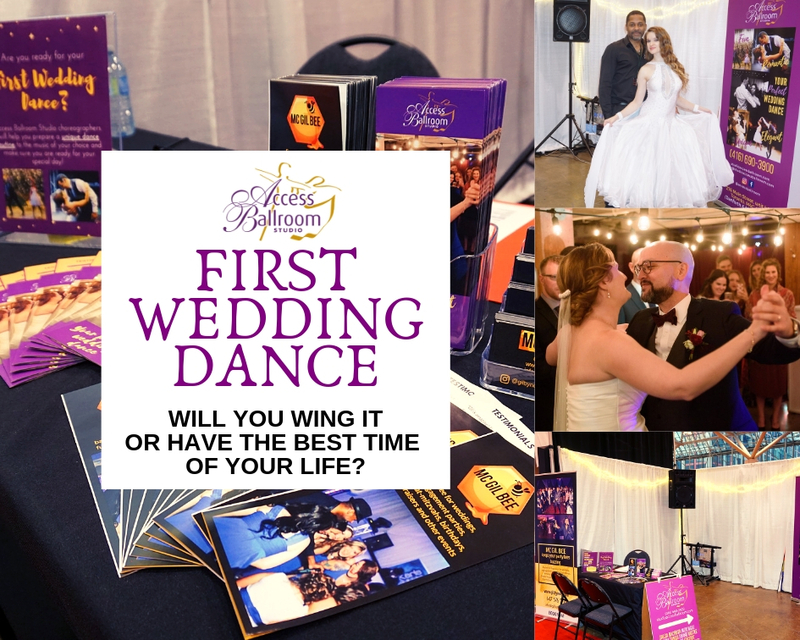 During the event, you will have an opportunity to chat with the staff about the dance packages and other services we offer. Moreover, you will get a chance to meet our students and dance instructors and even see them perform! You will also get a taste of our group classes and practice parties. Question: I am a complete beginner, can I still join? Answer: Certainly! You can definitely take the beginner group class at 7:50 pm. As for the social dance party, our dance instructors will be there to show you the basic steps for each of the dances. 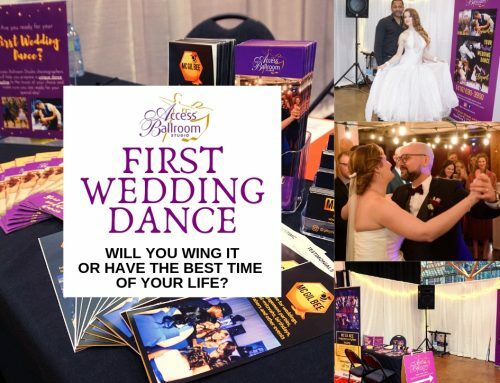 So you will get to enjoy the party just like those who have taken dance lessons before. Question: Do I need to bring a partner to dance with to be able to join? Answer: No, you don’t have to. You can come alone or with a partner – up to you. You’ll always have someone to dance with. Early bird tickets are $20 and already on sale online on Eventbrite and at the studio. So hurry up to get yours, as the price will be $25 at the door! Check out our Cha Cha playlist on Soundcloud to get into the mood for the party. RSVP on Facebook and invite your friends. 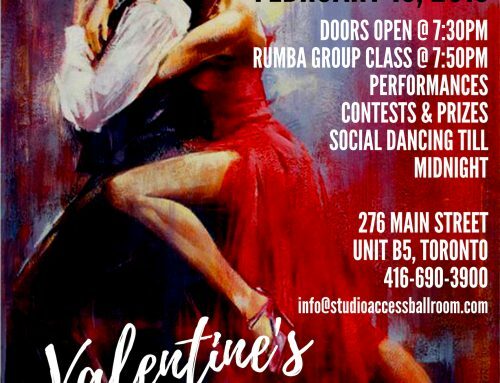 The event will be held at Access Ballroom Studio Toronto Beaches location near the intersection of Main Street and Danforth. Contact us for more details or to purchase your tickets! I love this dance school! I had my first couple dance class and I absolutely loved it. Not only that, I loved all my classes after that as well. 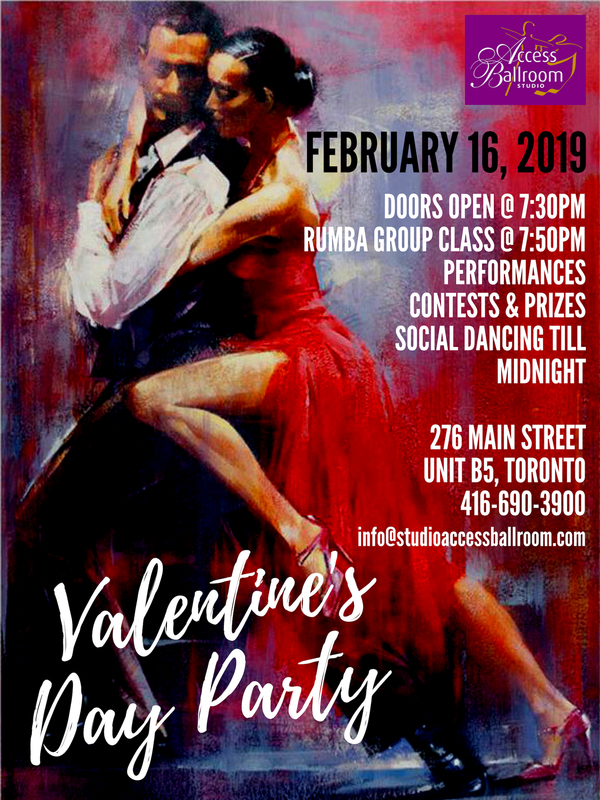 In a short period of time I was able to improve in a variety of dances like salsa, bachata, merengue, waltz, rumba, foxtrot, tango, swing, hustle, you name it! Gil and Valeria make you feel comfortable right away and pay attention to what you are looking for in dance lessons. Very good with scheduling your classes, they will keep you at it! The studio is open every day which makes it easy to plan your dance lessons. The prices are well worth it. Love the events they’ve put together that showcase the students’ progress and encourage everyone to dance! Access Ballroom also has a monthly newsletter which helps stay up-to-date with class schedule and events. Gil and Valeria’s passion for dance will certainly lead you to the dance floor! You will learn a ton and have fun while doing so! I would definitely recommend Access Ballroom. If you’d like to prepare for the party in advance and have never tried dancing before, do not worry! We’ve got you covered! 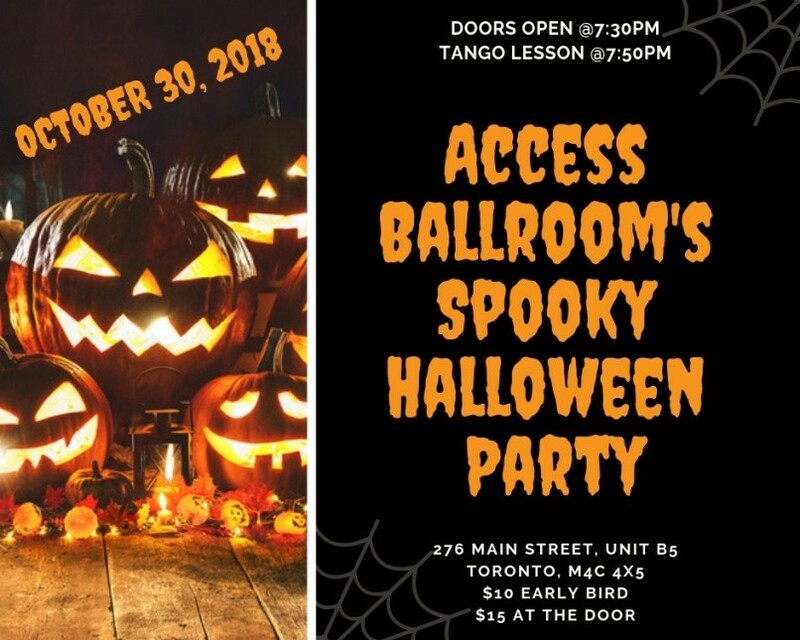 Book your trial private dance lesson at Access Ballroom by email info@studioaccessballroom.com as well as via phone 416-690-3900.